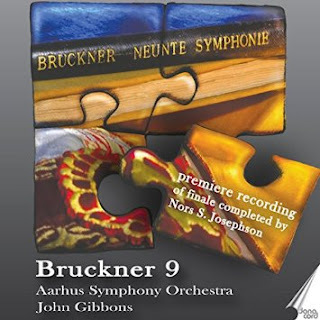 Few conjectural finales seem as surplus to requirements as that of Bruckner’s Ninth. The ending of the Adagio, with its somber yet consoling Wagner tuba chords, feels like the ideal conclusion to a perfectly formed three-movement work. Bruckner himself, of course, didn’t see it that way, laboring over the finale for the last year and a half of his life, and still working on it on the morning of the day he died. The work’s tortuous history suggests that listeners, if nothing else, have a personal obligation to the composer to perceive the symphony in terms of a four-movement whole. In fact, the finale as Bruckner left it is not as skeletal we’d like to believe. Bruckner completed approximately the first half, left most of the remainder in short score, and only the coda is missing. The apparent perfection of the three-movemenet version has led to this incomplete finale being almost completely ignored, at least by performers and listeners. Scholars, on the other hand, have taken the matter more seriously. Bruckner’s surviving sketches (there is some evidence that material for the missing coda was pilfered by trophy hunters soon after his death) reside in the Nationalbibliothek in Vienna and the Viennese Hochshule für Musik. They were first published under the editorship of Alfred Orel in 1934 (now available online at the Austrian Academy of Sciences’ excellent new Bruckner web site, bruckner-online.at). Looking at that edition, it is clear that much interpretive work is required for the second half of the movement. The short score is usually on four staves and usually only includes two lines, typically a melody line and a repeating accompaniment figure. Then there is the issue of the coda. From the finales of Bruckner’s earlier symphonies, we can infer that he would have brought back some of the thematic ideas from the earlier movements. But how to do that without the results sounding cheap? As so often with Bruckner, his (inimitable?) genius shines through in his ability to make the obvious sublime. Young’s reticence may be a result of more recent editorial activity, specifically the new completion by a team of four Bruckner scholars led by Nicola Samale. The first Samale version appeared just a year after Carragan’s, with revisions up to 2011. This 2011 version brought the whole project of Ninth Symphony completion into the public eye, thanks to Simon Rattle and his recording of it with the Berlin Philharmonic. All of which makes the present recording seem slightly anachronistic. It presents, for the first time, the edition made by Nors S. Josephson in 1992. Comparing the Josephson with the Samale, we find the same kinds of issues that separate the various completions of Mahler’s Tenth. Josephson, like Deryck Cooke, avoids ostentatious additions wherever possible. As a result, the sound is often threadbare: grandly orchestrated, but with harmonies based on excessive doubling, and a notable absence of counterpoint. That makes it all the harder for him to justify quotations from earlier movements that appear in the coda, which now seem all the more pasted on. That said, that standard Bruckner tropes are all elegantly served, the brass chorales are suitably voiced, and the running string lines are well balanced within the section. Sadly, the performance itself does no favors to the edition it is designed to champion. There is little drama or tension in the earlier movements, and the generally slow tempos that John Gibbons takes never lend the music any of the grandeur he seems to be aiming for. The scherzo is the most successful movement here, for the breezy, light-hearted approach Gibbons takes (in stark contrast to the rest of the reading). But throughout the performance the Aarhus orchestra is on poor form. The string sound is thin and scratchy, and the brass intonation is very poor. These problems are particularly apparent in the Adagio, which is ironic, given that this is exactly where the performance needs to excel in order to make the best cast for the finale to follow. It is difficult to separate the performance issues from the editorial issues in the finale itself. However, the first 235 bars were completed by Bruckner, making direct comparisons possible. The conviction and dramatic momentum that Rattle and the Berlin Players bring to these opening five minutes or so leave Gibbons and the Aarhus Symphony for dust. As the two recordings diverge, the editorial issues no doubt come into play, but Rattle is on top form here, and imbues a sense of inevitability into the Samale edition through the sheer force of his interpretive conviction. Going back and listening more closely to the Samale, many of the same issues start to become apparent, particularly the excessive repetition and the thin chord voicing disguised under heavy orchestration. But comparisons with the present recording elevate everything in the Rattle/Samale version. If you want a Bruckner Ninth finale that feels like the real thing, listen to Gibbons/Josephson and then listen to Rattle/Samale. The comparison is like a journey straight into the mind of the composer. Otherwise, avoid this recording, and this edition too. Neither makes a remotely convincing case for hearing the Ninth Symphony as a four-movement work.